Seymour was the 1st Duke of Somerset. When Edward VI became king he was only 9 years old and Seymour was made his first 'Protector'. Seymour's job was to advise the young king because he was not old enough to make decisions himself. 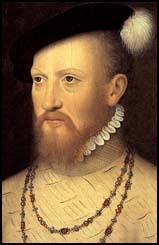 He also became Earl of Hertford when Henry VIII married his sister Jane Seymour. He was executed for treason in 1552. It is believed that the charge of treason was a fake one that had been made up to get rid of him.